Murakami, M., 2019: Inner structures of snow clouds over the Sea of Japan observed by instrumented aircraft: A review. J. Meteor. Soc. Japan, 97, 5-38. Chan, K. T. F., and J. C. L. Chan, 2018: The outer-core wind structure of tropical cyclones. J. Meteor. Soc. Japan, 96, 297-315. Kitoh, A., 2017: The Asian monsoon and its future change in climate models: A review. J. Meteor. Soc. Japan, 95,7-33. Hayasaka, T., 2016: The long-term variation in surface shortwave irradiance in China and Japan: A review. J. Meteor. Soc. Japan, 94, 393-414. Weng, Y., and F. Zhang, 2016: Advances in convection-permitting tropical cyclone analysis and prediction through EnKF assimilation of reconnaissance aircraft observations. J. Meteor. Soc. Japan, 94, 345-358. Grabowski, W. W., 2016: Towards global large eddy simulation: super-parameterization revisited. J. Meteor. Soc. Japan, 94, 327-344. Kato, S., N. G. Loeb, D. Rutan, and F. Rose, 2015: Clouds and the Earth's Radiant Energy System (CERES) data products for climate research. J. Meteor. Soc. Japan, 93, 597-612. Yoshimura, K., 2015: Stable water isotopes in climatology, meteorology, and hydrology: A review. J. Meteor. Soc. Japan, 93, 513-533. 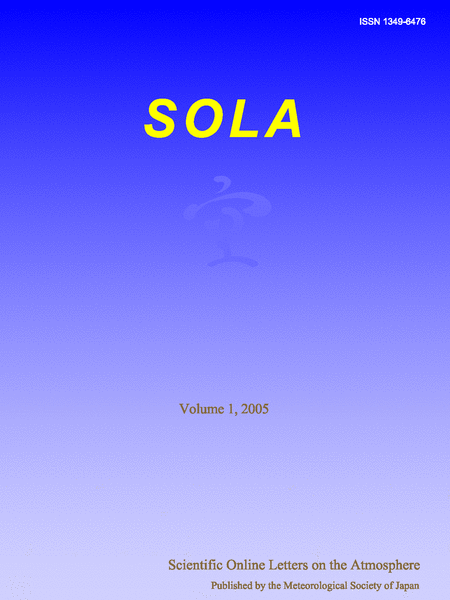 Ohmura, A., 2014: The Development and the Present Status of Energy Balance Climatology. J. Meteor. Soc. Japan, 92, 245-285. Ruiz, J. J., M. Pulido, and T. Miyoshi, 2013: Estimating Model Parameters with Ensemble-Based Data Assimilation: A Review. J. Meteor. Soc. Japan, 91, 79-99. Zhang, R., T. Koike, X. Xu, Y. Ma, and K. Yang, 2012: A China-Japan Cooperative JICA Atmospheric Observing Network over the Tibetan Plateau (JICA/Tibet Project): An Overviews. J. Meteor. Soc. Japan, 90C, 1-16. 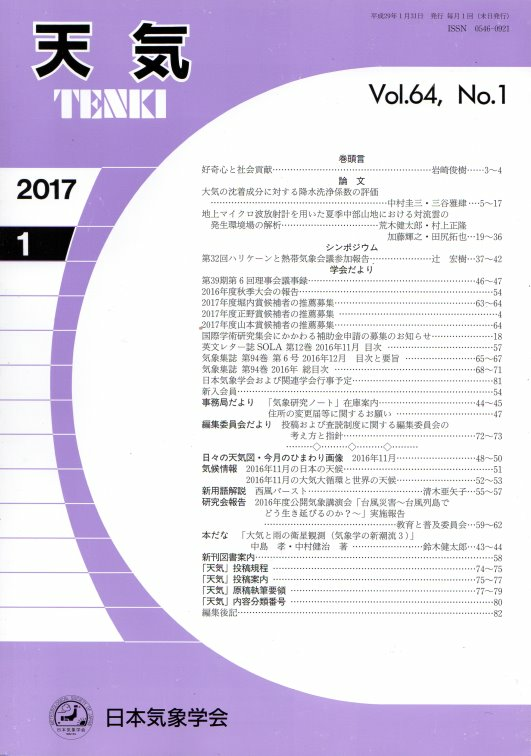 Kondo, Y., N. Takegawa, H. Matsui, T. Miyakawa, M. Koike, Y. Miyazaki, Y. Kanaya, M. Mochida, M. Kuwata, Y. Morino, and M. Shiraiwa, 2010: Formation and Transport of Aerosols in Tokyo in Relation to Their Physical and Chemical Properties: A Review. J. Meteor. Soc. Japan, 88, 597-624.